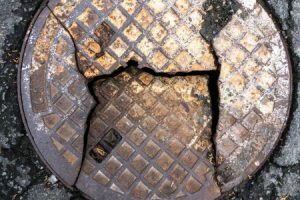 How To Make A Manhole Cover And Drain Accident Claim – How Much Compensation Can I Claim For Personal Injury? If you have been injured following a manhole cover and drain accident then you may be eligible to claim compensation. Accidents like this are more common than you may think and can lead to serious injuries which can impact on the quality of your life. From cuts and bruises right through to head and spine injuries. Slips, trips and falls caused by manhole covers have the potential to be devastating. Whether your incident occurred on public or private land, a personal injury solicitor will be able to help you establish liability and win the compensation that you are entitled to. Call Advice.co.uk for more information on 0161 696 9685 and read on to find out more about making a personal injury claim following a manhole cover accident. What Is A Manhole Cover Or Drain Accident? Who Is Responsible For The Maintenance Of Manhole And Drain Covers? How Much Time Do I Have To Make A Manhole Or Drain Cover Accident Claim? How Do I Make A Manhole Cover Accident Claim? If a pavement or road is uneven due to a drain or manhole cover that has not been maintained properly, it can result in a slip, trip or fall for a pedestrian or even a bicycle or car accident. If you have been involved in an incident like this then you may have received some nasty injuries as a result. No matter where the accident took place, you have a right to claim compensation for your injuries. A personal injury solicitor will help you to gather evidence and prove liability in order to build a strong case that will help you to maximize your compensation payout. Read on to find out more about manhole cover and drain accidents. Following a manhole cover and drain accident, you may be wondering how much compensation can I claim for a drain or manhole cover injury? The answer depends on the injury you have suffered. We don’t tell you to use a personal injury claims compensation calculator. A table like this one, which has been put together from the Judicial College’s Guidelines will help to give you a rough idea about the amount you may be able to expect to receive. For a more accurate estimate, you should speak to a personal injury solicitor who will take into account the specific details of your case. Following your accident you can claim compensation for the pain and suffering you have experienced as a result of your injury. The more serious the injury and the more long-standing, the higher the payout of compensation you will be eligible to receive. If your injury was so severe that you were unable to return to work immediately then claiming compensation for loss of earnings can help ease the financial burden during this difficult time. If you were required to pay any medical expenses that are directly related to your injury such as medication or private healthcare then you can claim these back as long as you have receipts. If you incurred travel expenses, perhaps travelling to and from medical appointments, then these can also be claimed back as part of your compensation package. If you were so badly injured that you required help around the house then the person who assisted they may be able to claim care costs. A drain or manhole cover accident is an incident that happens when an individual slips, trips or falls over a drain or manhole cover on the ground. This type of obstacle is sometimes raised up slightly from the ground, causing the tripping hazard. Open drain and manholes also present serious risk of injury. Individuals who are harmed following a drain and manhole accident often suffer rather serious injuries including fractures, sprains, lacerations and even head injuries and spinal trauma. The seriousness of the impact makes it highly likely that you will be able to make manhole/ drain cover compensation claims if you have been injured in this way. Uneven drain and manhole covers are common. You can probably spot one on every street you walk down. Local authorities do their best to maintain and level out any imperfections on the pavement to reduce the possibility of members of the public tripping and falling. Ideally, these covers will be flush to the ground so that they don’t present a tripping hazard. However, it is not always possible to carry out the work on a regular enough basis to ensure that all drain and manhole covers are flush to the ground at all times. If you have a manhole cover and drain accident then it depends where the hazard is located as to who is responsible for maintaining it. You should ask yourself, who is responsible for drain covers in this area? If the accident occurs in a public place such as a park or a pavement then it is usually the company responsible for the local water supply and sewage. The water authority has a responsibility to maintain, replace or repair the covers when necessary. If however, the manhole cover injury occurs on private property then it is the responsibility of the landowner or occupier. Any covers located on private property should be maintained, repaired and replaced by the owner or occupier of that land. It is not always straightforward to identify the person responsible, even if you know that the land is either private or public. Therefore we recommend that you seek the advice of a personal injury lawyer who will be able to help you establish liability and blame and move forward with your drain and manhole cover injury compensation. Proving liability for a manhole cover and drain accident is key to winning the maximum possible compensation. Ideally, you should take a photograph of the manhole cover after you have suffered your injury. Even a quick photograph with your smartphone will help you to prove that the hole or cover was presenting a tripping hazard. You should also seek immediate medical assistance. Not only will this ensure you get the treatment you need to have the best chance of recovery, your medical records will also be used as evidence in your personal injury case. It is essential that there is a written record of your injuries from a healthcare professional. It can also be helpful to gain witness details or witness statements. These witnesses can be helpful to your personal injury solicitor in proving that you had no blame in causing the incident. In order to make a successful claim following a manhole cover and drain accident, you need to be able to prove that somebody else’s negligence caused your accident. In this case, that means providing evidence that either the water company, local authority or landowner had failed to properly maintain, repair or replace a broken or uneven drain or manhole cover. There are certain safety standards that must be adhered to and if it can be shown that the standards were not met, and you suffered an accident as a result then you are eligible to claim damages against the guilty party. For example, you should prove that the uneven surface had a depth of at least 1 inch. This is usually held as the minimum depth needed to launch an accident claim. Be aware that you are eligible to claim compensation if the appropriate standards are met, no matter where you are. Your claim is not limited to pavements. You can seek compensation following a trip or fall on a drain or manhole cover in a car park, shopping centre, supermarket or in the grounds of a hospital. This list is not exhaustive and if you have suffered a slip, trip or fall due to a drain or manhole cover in disrepair then speak to Advice.co.uk today to seek further advice. Whilst uneven manhole covers may appear to be a minor annoyance, the potential injuries that can be suffered following an incident range from bumps and bruises right through to death. A manhole cover conceals a deep hole into the water or sewage system below. If a hole is left exposed or a cover is loose or broken and a pedestrian slips into that hole then they can suffer life-altering and even fatal injuries. Not only can a hole in the road cause damage to your bones, head and spine, the area below is contaminated by pathogenic bacteria which can lead to infection causing a variety of nasty diseases. Even a slip, trip or fall can lead to fractures, broken bones, lacerations, leg injuries, concussion and ligament damage. All of these conditions would require hospital treatment and potentially a long period of recovery. You should bear in mind that if you have an accident in a public place you can bring a claim against your local authority. However in order to make a claim against the council for personal injury then you must have suffered a physical injury. It is not possible to bring a case like this on the basis of psychological or emotional distress alone. You also need to be able to prove the physical injury so seeking medical advice as soon as possible after the incident is crucial. When a case is brought against the council, the council have a burden of proof to show that they have acted in accordance with section 58 of the Highways Act 1980. 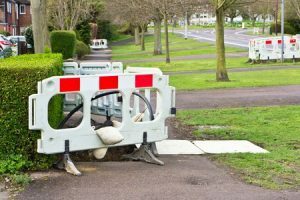 This requires local authorities to actively maintain roads and pavements following regular inspection of these public areas. Specialist solicitors provided by Advice.co.uk can assist you with your personal injury claim against the council by helping you to establish liability and put together a strong case using the evidence you have provided. Drain cover and manhole cover accidents can also happen to cyclists and vehicle drivers. If a bike or car hits an uneven piece of ground, it can cause them to either fall off their bicycle or lose control of their vehicle. This, in turn, can lead to serious injury. However, by far the most common injuries caused by ill-maintained drain and manhole covers are slips, trips and falls. These types of pedestrian incidents at the very least cause bruises, cuts and maybe twists or sprains. They can, however, cause more serious life-changing injuries. If you have suffered a serious injury as a result of a manhole cover and drain accident then you may find you are unable to work and even care for yourself, either for a limited amount of time or for many years to come. If this is the case then you may need to seek compensation in order to financially support yourself following the accident. No matter where you suffer this kind of accident, you may be eligible to make a claim. Advice.co.uk will help you to establish who is responsible for the accident and will assist you in launching the claim and securing you the compensation you deserve. The responsible party when it comes to private property is dependent on who is responsible for property maintenance. This could be the owner or the occupier. It is important to find out the answer to this before you are able to launch your claim as you need a named individual or organisation. Your solicitor will be able to help you access this information. It is tricky details like this that mean we always recommend you seek legal representation in a personal injury case rather than trying to launch a claim independently. If you suffer an injury involving a manhole cover whilst you are at work then you may be able to make a claim against your employer. Your employer has a duty of care to safeguard your health and wellbeing whilst you are at work. If it can be proved that your employer was negligent, or failed to provide appropriate training or protective equipment which led directly to your injury then you can claim compensation from them. You may have been asked to lift a manhole cover as a result of a repair following vandalism, replacing damaged equipment or resolving flood damage to name a few reasons. If you were at work, report the incident to your manager as soon as possible and ensure that it is entered into the accident book. If the incident occurred on private land such as a shop car park then you should report it in store to be logged. Take photographs of the area where you were injured so that the tripping hazard can be identified. See a doctor and ensure that your injuries are logged onto your medical record. Take witness details and statements if anybody saw the accident happen. Although you may be feeling a little dazed and confused following your accident there are a few important things to keep in mind in order to maximize your chances of success and the amount of damages you receive. Be aware that the personal injury claims time limit is usually 3 years but exceptions can occur. If you fail to make your claim within three years, it may not be accepted by the court unless there were exceptional circumstances. It is however helpful to your case to launch the claim as quickly as possible whilst details are fresh in your mind and it is easier for your solicitor to gather evidence. Hiring a personal injury solicitor is one of the most crucial things you can do to maximize your chances of success. There is no substitute for the expertise and experience held by a personal injury lawyer. Launching the claim on your own will significantly reduce your chances of success, and you will not be able to access the same kind of support that you would if you chose a company like Advice.co.uk to offer advice and assistance with finding a lawyer. If an insurance company offers you a settlement then think carefully before accepting it. Although it may seem like an easy solution, be aware that in most cases you will receive a bigger payout if you launch a compensation claim. Most personal injury solicitors work on a no win, no fee basis so you should not be asked to pay any fees upfront. Once you have sought medical attention and gathered the appropriate evidence, you should contact a personal injury lawyer who will be able to help you to launch your claim. This will involve establishing responsibility for maintaining the manhole covers, proving liability and submitting evidence to show that somebody else’s negligence was the cause of your injury. Advice.co.uk along provide personal injury solicitors who work on a no win, no fee basis. This means that you are only required to pay a fee after you have successfully received a compensation payout. They do not ask for any upfront fees and there are no hidden costs. When you win your case and receive your money, their fee is payable from that. This vastly reduces any financial burden on those claiming. Advice.co.uk have worked with clients to help them make many manhole cover and drain accident claims over the years. Our experience and expertise is something we’re proud of. We treat our clients with respect and professionalism, keeping them informed of developments at all stages of the process. However, we also like to make the process as stress-free as we can for our clients and so we shoulder as much of the burden as possible. Feel free to speak to one of the members of our team for a free consultation before launching your claim. They will be able to give you advice on the process and will help you make a decision as to whether or not you would like to proceed. If you decide to go ahead and make your claim then the solicitors provided will do so on a no win, no fee basis and will seek to secure you the maximum possible compensation they can. For a highly experienced personal injury advice and the provision of a solicitor who works on a no win no fee basis, call Advice.co.uk today on 0161 696 9685. Alternatively contact us via our website and we will get back to you. We look forward to hearing from you. Pavement information – GOV – Injured on the pavement? Read more here. Broken bones questionnaire – NHS – Do you know if a bone is broken? Head injury information – From the NHS.